These Custom Disney shirts were provided by ShirtSpace so that I could share these nerdy Tangled designs with y’all. Because everyone loves a good smolder….. Growing up Belle was my favorite Disney princess. I could totally relate to that odd bookworm and I just loved her. But if Tangled had come out when I was a kid I have a feeling there’d be some competition for the top spot in my favorite Disney Princess list. I don’t know if it’s Rapunzel herself or that sarcastically fun Flynn Ryder, but the movie has become one of my obsessions. And any time I can catch Flynn or Rapunzel in a parade or show at Disney I am all about it. Give me the smolder. GIVE ME ALL THE SMOLDERS. Every time we have a Disney trip coming up I always want to make us shirts for it, and I always run out of time. I like to blame it on the fact that I have a two year old (as of Saturday) and nothing ever gets done….but in reality I just don’t make time for it. But somehow, in-between party planning and moving into our new home, I found the time. HOORAY! So we’re going to have really fun Tangled-themed shirts for us to wear on our son’s birthday trip. And I may have picked these designs because I have a slight crush (shhhhhh, don’t tell Chris) on Flynn Ryder. I mean, THE SMOLDER YOU GUYS. Who can resist the smolder?! I made these awesome shirts the way I make all my cool heat-transfer t-shirts. But this time I used rose gold vinyl for my purple shirt and I’M IN LOVE. Not only are these shirts from ShirtSpace true to size, super soft, and oh-so comfortable, but they look really good with vinyl. Vinyl does make everything better after all! 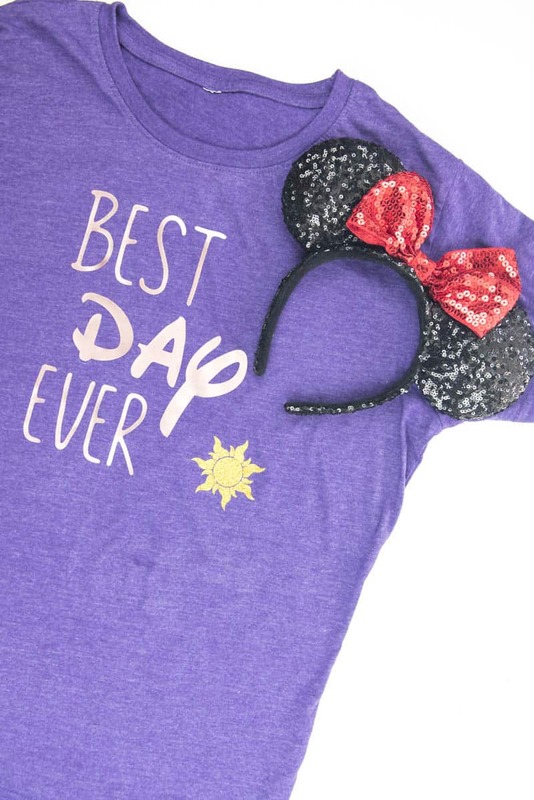 And now I really want the new rose gold Mickey ears that Disney has to go with the shirt. Any excuse to get new Mickey ears, amiright? I’m so excited to wear our family shirts on our next trip and to see what other people are wearing and the designs they’ve come up with. I seriously think custom shirts are the way to go when you’re at Disney, and I’ve got a few good reasons why! 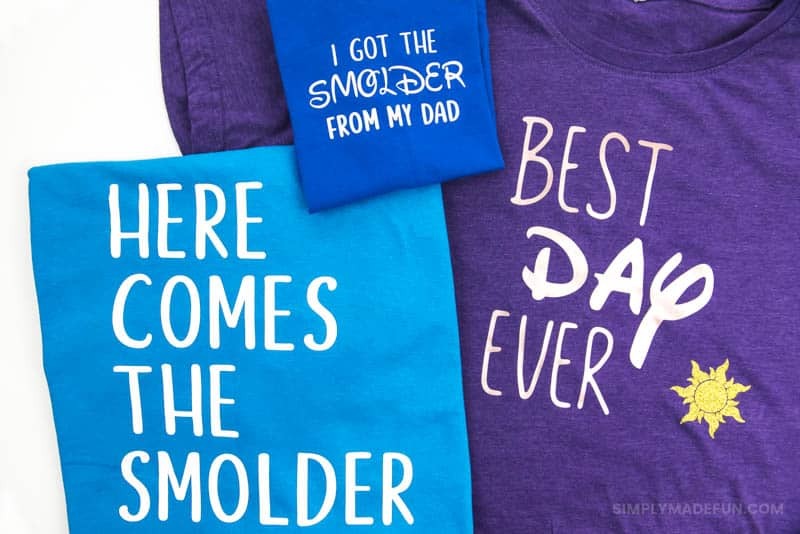 Five Insanely Fun Reasons to Make Custom Disney Shirts! I love talking to other families when we’re in line for rides and shows at Disney World, especially when the conversation starts from complimenting their custom Disney shirts. There’s always a fun or interesting story behind the shirts and it’s not only other guests that take notice. Cast members love custom shirts and I’ve seen quite a few shout across loud crowds to compliment them. If you’re celebrating something fun (like a birthday or anniversary) a colorful shirt with big bold letters is way more noticeable than a button. If you like when people notice you’re celebrating but feel like buttons don’t draw enough attention, custom Disney shirts are always a great option! If you have young kids bright colored t-shirts are always an easy way to spot them in those crazy Disney crowds. Especially if those shirts have crazy or fun sayings on them. When you’re wearing shirts with fun sayings on them characters almost always react to them. Especially if it has to do with their “world”. These Tangled custom Disney shirts make me want to go see my favorite Princess on our September trip to see if we can get a fun interaction out of her! If I do, I’ll report back! Are you snarky? Silly? A little bit sarcastic? Yea…I’m all three. BUT! Custom shirts always match your personality more than store-bought mass-produced shirts. That’s the main reason I love making our own custom Disney shirts for our trips and why I’ll keep making them. They’re so much fun! 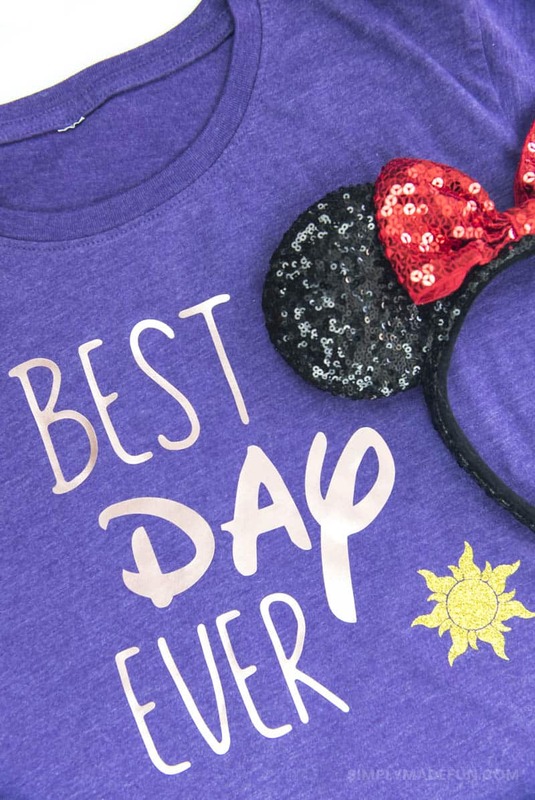 Have you ever made (or bought) custom Disney shirts for your trips? What are your favorite sayings to put on them? I totally agree with custom shirts!!!! We only have been to WDW as a family 1x but had 2 different sets of matching shirts. 1 day we were given free ice cream from the dessert cart by cast members on a scavenger hunt for people from our state (the shirts had our state with a Mickey head in the middle) and another day we were given front row seats and a meet and greet to the Lion King (after a lengthy chat with a higher up cast member stemming from our shirts). I say 100% on making shirts! On shirtspace, which brand shirt do you like to go with? Hi Katie! Bella + Canvas is my favorite brand! Gideon is also great!